As we age, our adult teeth often become darker, yellower, or stained. Tooth whitening applied in a dental office is the preferred method because the process is more effective and the rest of the mouth and gums is better protected. Tooth whitening can last for one or more years, depending on diet, oral hygiene as well as regular maintenance that can include over the counter whitening products. 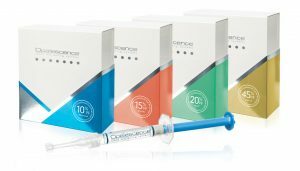 For a brighter, whiter smile without the wait, choose Opalescence® Boost, an in-office, chemically activated whitening treatment that offers results in less than an hour. It’s ideal for people who want instant whitening gratification or those who have that special event coming up that requires a bright, white smile.